Home Production	Beacons – A guiding light for production? Amsterdam is a city full of attractions, famous museums and tourists. For a city boasting such an enormous offering of leisure and sightseeing opportunities, its surface area is comparatively small. Even the historical facades of the Dutch capitol can be deceiving, because Amsterdam is moving and evolving with the times. One example of modernization is the city’s beacon project. These Bluetooth, low energy devices are being installed across downtown Amsterdam. In essence, beacons serve as small transmitters that constantly relay their position and allow people to connect via their smart devices. 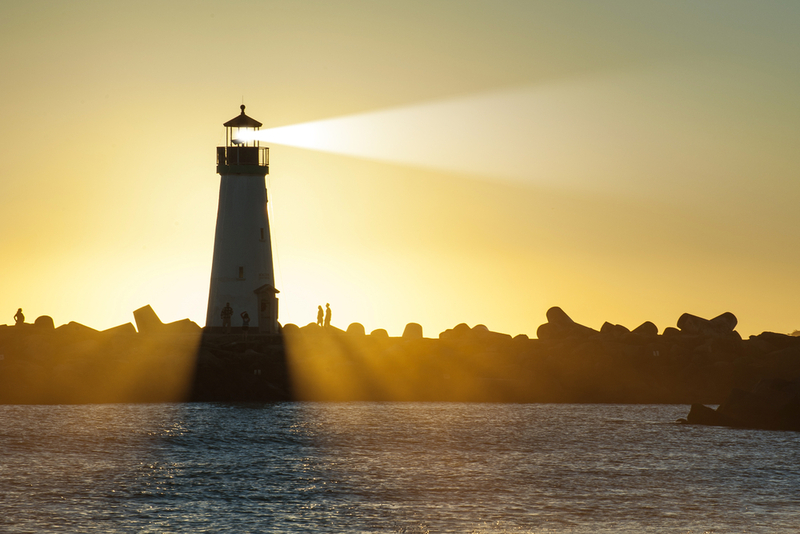 A beacon is traditionally defined as a guiding light, often used to guide ships safely to harbors. This is a perfect name, since these transmitters, or beacons, can transport their data up to 100 meters via Bluetooth. Beacons are already being used in retail businesses to help “guide” potential buyers to their next purchase. IKEA, for example, is using beacons to increase customer retention and communicate directly with shoppers while they are browsing in a store. The tourism industry is also latching on to the trend. The German railway company, Deutsche Bahn, is currently testing the beacon technology to assess consumer acceptance, and plans to offer location-specific advertisements and services. But getting back to tourists and Amsterdam: Lampposts as well as streetcar and bus stops are now equipped with these data transmitters. The result is the so-called “Amsterdam Beacon Mile”. Here, passers-by can access advertisements or other information on their smart devices via a push-message — a testing environment for advertisement companies that implement beacons as an additional channel of communication. But do people really welcome this technology? Do you always want to be a target for the next big marketing campaign? And even if you do value the data you get, do you really want to have to install an App in order to use this information? From a consumer point of view, there are still a lot of open questions. However communication via beacons does not need to be restricted to the advertising industry. In other words, a human being does not always have to be on the receiving end of the transmission. With the help of wireless transmitters, machines can also “talk” with other machines, or communicate with various materials. This beacon technology represents a significant opportunity for the production sector. For example, by means of communication with beacons during the running production, machines, people and materials can be identified and located. Unlike the relatively old RFID-technology, the beacon itself transmits the data. By contrast, RFID-chips allow communication only via feedback with a software service specially conceived for this purpose. Moreover, Beacons are distinguished by their very low power consumption, real-time transmission, and low initial costs. You can already imagine the enormous potential of these small data transmitters in tracking parts during the production process. Through the fast data transfer, site- and responsibility-based maintenance- and capacity utilization figures can flow even better into the monitoring and maintenance of machines. There are huge optimization opportunities, especially for complex production processes such as in single-piece and small-series manufacturing, which is frequently hampered by high missing-part quotas, backlogs and suboptimal adherence-to-schedule. If the conditions of machines and location of tools can be determined more easily, and data can be made accessible faster, the complexity of production processes and their scheduling has the potential to be significantly reduced. This, in turn, would lead to an improved steering of logistical and industrial processes. Using a smart phone, the production manager could go through the production site and read real-time information from machines such as downtimes or failures. Combined with Business Intelligence tools, the manager could also use dashboards that would enable a fast and clear analysis of the individual machines and their batches. In addition, beacons might ease information exchange in production. The annoying communication regarding the whereabouts of an important service order in the production process would become obsolete. Instead, with beacons, this order could be quickly located and, thus, be prioritized in an efficient manner. Especially in single-piece and small-series production, it is important to keep the production process as transparent as possible: It is necessary to know who produced what item under which particular conditions and when. An apt example is the increased number of car recalls in the automobile industry last year. During such recalls, it is mostly important to know the precise material, lot and quality specifications that flowed into a particular product at a particular location and time. The beacon technology can help suppliers immediately respond to customers’ queries, thereby enabling them to quickly control their own performance processes. To summarize, beacons have the potential to change the future of production and logistics. The transmitters can enable a faster and simplified communication and data transfer in many fields of application. However, it remains to be seen how far this new form of data transfer in production sites will be realized and whether the boundaries between the virtual and real world will fade with time — just like in the famous harbor city of Amsterdam. In my opinion, within the scope of the software initiative called ‘Industry 4.0’, beacons could help promote innovative optimization in the field of production.